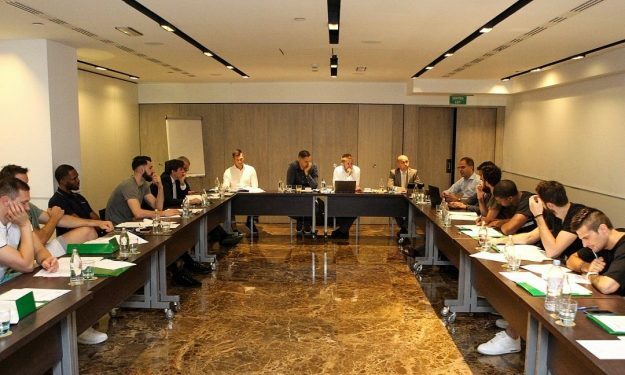 The EuroLeague Players’ Association had a meeting for the first arrangements and improvement for the players. The EuroLeague Players’ Association addressed some of the first proposals to the EuroLeague shareholders’ meeting for improvements in the new season. These proposals were made during June’s General Assembly of ELPA in Barcelona and were the outcome of a very productive meeting. These initial suggestions were focused primarily on ensuring better and faster recovery for players due to a greater number of matches. The EuroLeague clubs agreed with the proposals and said that they would take them into account in the next season. Some of the other approved proposals were the use of priority lanes for check-in and security control, use of exit row seats on planes when possible, more rest days between games and following the conclusion of a game so the next practice or physical activity would begin at the earliest 12 hours later. ELPA also arranged for all players to have a uniform right to a second medical opinion, so the players would have the opportunity to request a neutral second medical opinion of a licensed doctor. ELPA’s representatives would like to thank the EuroLeague and all the clubs for support, understanding and the start of an excellent cooperation that is reflected in the adoption of the first proposals. This is a big milestone for ELPA, which immediately after its establishment managed to arrange improvements for players, while it took a step further in cooperation with EuroLeague and its clubs. Surely, these are only the first steps – the main goal of ELPA is the general Collective Bargaining Agreement with EuroLeague, the negotiation of which will start immediately. Through collective bargaining with EuroLeague Basketball and the EuroLeague clubs, ELPA will seek to achieve a higher level of protection of players’ individual and collective rights and to improve the working conditions, economic benefits, and job security of all its members, per ELPA. Aside from the fact that ELPA had a meeting about possible improvements in the new season, the EuroLeague Players Association were also introduced to the National Basketball Players Association (NBPA) in Milan this summer.